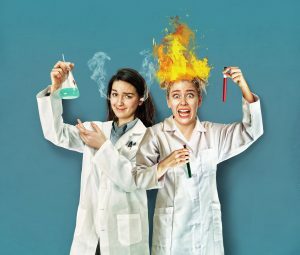 We Now Know is a one-hour rapid-fire comedy chronicling the complete history of science, as told by one expert, and her assistant who is convinced that science is boring. Over the course of the play, she teaches her assistant about the highs and lows of humankind’s struggle to make sense of the universe around them; from Pythagoras to Einstein, from Mayan numerology to Stephen Hawkings. By exploring the constant evolution of what “We Now Know”, our intrepid hosts realize that the more we learn, the more there is yet to discover. Using whip-smart comedy, puppets, masks, physical theatre, original songs and audience participation, Monster Theatre will explore the discoveries, inventions and innovations of humankind since the dawn of time. Some of the more complex theories and ideas will be distilled to hilarious and accessible demonstrations, like sub-atomic particles explained with hula hoops, or the complex nature of light by using ‘the wave’. While some of the more colourful figures from our scientific past will be presented using pop culture references, like Isaac Newton as played by Lady Gaga, or the story of Marie Currie as a mutant Zombie flick. By having both an ‘expert’ character and her comedic ‘assistant’, we are able to present the content factually, while still having someone whom the teen audience can relate to… and laugh at! It’s history without the boring stuff. Always committed to thorough research, Monster Theatre is thrilled to partner with Science World. While Monster Theatre provides the theatricality, Science World offers a wealth of resources including access to their experts and library of knowledge, hands on materials for in-show demonstrations and the venue itself in which the show will premiere. We Now Know shows that the greatest lesson from the History of Science is that the Future is more wonderful than we can possibly imagine, and serves to remind young audiences that the discoveries of tomorrow rest in their hands. This is what we now know, think of how much more there is to discover!